Relevant to the study’s findings, I’m agnostic. Where do you fall on the debate in the middle of the page about atheism and agnosticism, though – if I may ask! J. J.: This one: a person can disbelieve in gods (atheism) without claiming to know for sure that no gods can or do exist; the result is agnostic atheism. Casey: Precisely mine as well. I thought the way they distinguish the different possibilities is very clear-cut on that website. Remind me to tell you about nelephants. I have a college professor who is very knowledge about how to talk about epistemology (haha, ironic!). You can Amazon.com him – Garrett Thomson. J. J.: I’m sure you’re aware of the Flying Spaghetti Monster? The strong/weak syntax should probably be changed, too, because most people see a belief in nothing as weak in itself – maybe call it “personal” and “universal” agnosticism/atheism instead. Believe it or not, I used to be a creationist. There’s such a HUGE variety of beliefs and nomenclature on this topic. As a former fundamentalist, I can actually relate to their side of things (and I can see why smart people like Morgan can fall for it), but pushing a pseudo-science “intelligent design” argument (as a front for a Christian God argument) is the beauty of the “Pastafarian” movement. I wish I could travel into the past and have a discussion with my former self about this. In other exciting news, did you hear about the new planet in the Gliese 581 system? This scientist is going to regret these words: I would say that, my own personal feeling is that the chances of life on this planet are 100%. I have almost no doubt about it. Casey: I would say that I exude the feeling of the strong, but the context of the weak. However those who are believers exude the same – they feel they know one way or another, when really it’s not something that we can talk about. The nelephants argument goes like this: it doesn’t make sense to talk about things we cannot have knowledge of. Let’s suppose there are elephants that exist in another realm we have no way of knowing about and we call these elephants “nelephants.” We cannot speak as to whether yes they do or no they don’t exist because we simply have no way of taping that other realm. So until we can tap into that realm, we should not even utter the word “nelephant” because it simply doesn’t make sense. I like your idea about how to change the labeling of the debate to universal versus personal. It more accurately reflects the nature of the positions (one is a statement about reality for all people and applies to everyone, the other is a statement about one’s own knowledge). But you know those philosophers love the terms weak/strong to characterize different positions! I have seen dogma – watched it with my brother who’s orthodox jewish. I was too young to really understand it fully, though. So my current debate is whether it is good for people to believe in religion or not. Some people lean on it and expect it to wash away sinful actions they commit, instead of applying their minds to their actions. I used to patently think that it was okay for people to believe, but, after a long discussion with a friend who has read all dawkins and that sort of literature, I am not as sure I should believe that. Certainly studies show that as a psychological mechanism it helps people recover from disease to believe in some force uncontrollable and outside themselves that is at work to help them. One of my college friends who believes in the bible and is a literalist simply does not know enough to support her own opinions when asked about different parts of the bible that contradict one another. I read about that planet this morning and how it probably has life. I’ll have to read that article, though. Random aside: “Life on Mars” by David Bowie is probably one of my favorite songs. Why can’t you travel into the past and have a discussion with your former self on this topic? Do you feel like your former self was simply hooked on the passionate or emotional prongs of the position or mentality? My first week at work Cameron and I got into a brief argument/discussion about arguments for and against the existence of god. I still need to rep my intro to philosophy arguments against an omniscient/omnipotent creator! I used to be more religious until I became a teenager. I went to confirmation class and Sunday school and church choir and basically spent all day in church as a youth. Once I hit high school for some reason, I decided against it. Hmm. And just thinking about these ideas for a minute makes me realize an even greater question: at what point do we hold people culpable for holding views that are downright incorrect? For instance, it’s one thing for my friend Jamie to be a literalist and a missionary-wannabe because she, in her political views and actions, is not extremist and does not denounce most culturally-liberal activities or views. She drinks, likes gays, etc. However, her actions do go against her “stance” on the bible – and she has not chosen to assimilate the two. So my question is this: if one were to express a pro-eugenics view, for instance, and said that the bible taught them that somehow (kind of a bad example), how would we hold them culpable? At what point in their schooling did they have the opportunity to learn about “alternative viewpoints” and decide not to extend their mind to the positions of others? I suppose that maybe speaking from your experience you would have more to contribute to answering this question than I would. To what extent are people responsible for their own education? I came to a conclusion a few years ago that when it comes to a belief in a “higher power” of any sort, you either have it or you don’t. It’s only through life’s intricate twists and turns that you can change your mind about belief or not. Rarely is it anything you have control over. We can really only hold people culpable for what they believe by pointing out the discrepancies in their beliefs – but that’s hard to do without coming off as arrogant. How forceful you are in holding people accountable requires you to measure just how much opportunity they’ve had to educate themselves, their IQ (seriously), and their emotional strength to be able to take that kind of challenge from people like us. Every situation is different. In your real-life example about Jamie, have you ever even asked her if she is a “literalist”. Sometimes, we assume things about people without understanding where they’re coming from. That’s the main thing – put yourself in their shoes and it’s a lot easier to be nice to them instead of talking down to them. Casey: That’s true, but I guess for whatever reason I don’t care about coming off as nice to worry about being viewed as a “prick” or condescending. With people I don’t know, I will try to sugar-coat things. For instance, in Wooster, a small, conservative town in rural Ohio that houses a great Amish farming community, I was checking out at walmart one day with a woman in her thirties, very nice, and who made some comment about global warming not existing. I didn’t really know what to do and thought about keeping quiet, but then I said, “you know I read something recently that made me consider global warming as a theory.” And then I went on and talked about a study of geological strata and how the heat within the past 100 years is indubitably caused by humans. Pretending to come from her perspective and not sounding as science-y as I did in this email, she actually bought my argument and was open to my perspective and agreed to look into the theory. My forcefulness just depends on the topic and the people. I will never push religion on people because I know it’s a very personal topic. Going green and being environmentally aware I will constantly push on people! I will push religion and climate control on people my own age in similar settings as me (e.g., Cameron) because I expect them to have a certain background, which they may or may not have. I did ask Jamie and in fact our premise going into the conversation was that Jamie believed the bible as it stands and thought that every word was true. J. J.: Nicely put. That’s quite a conversation [referring to the earlier e-mail mentioning Cameron] to get into your first week on a job! To me, religion is just another one of those world issues (like genocide, for example) that we could get angry about, but I don’t think the world is ready to be rid of religion altogether. Every society in the world has mythical history, so it’s not like we should be “crusading” to rid the world of it when it will constantly reappear. This is not to say that we can’t continue to publish facts that dispute religious systems. I appreciate the idea to cut out irrationality from the root, but in the end, it doesn’t make the crusader’s life any more fulfilling – again, there are better things to argue about. To answer your question about my past self – I remember having those evangelical conversations with people who would nonchalantly say that they haven’t thought about why they’re a Christian or that they rarely read the Bible. It would have been nice to have run into people who, instead, had eloquent arguments about why they don’t believe in Christianity or God (not saying that I’m that eloquent, but I at least have examined the scriptures and reasons for my belief). J. J.: Oh, cool. According to reviews online, Lerch’s followup Letter to a Christian Nation is even better. Casey: Hmmm. Of interest. I had a conversation about End of Faith with my pastor. It was uneventful, but he liked the book, found many faults in it similar to my own about the value of religion. 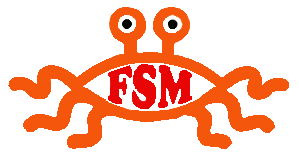 I read up on flying spaghetti monster and started laughing out loud. After I mentioned wanting to post this e-mail as a blog post, Casey wrote me: If I had two articles to add to our discussion one would be the text from my intro to philosophy course that had those arguments that showcase the contradictions of a biblical notion of an omniscient, omnipotent god and an article I wrote for my high school newspaper about biblical views on gays.